Once upon a time I went to a show and it was called Bunny Bunny: Gilda Radner, A Sort of Love Story. It was by Alan Zweibel and it was directed by Warner Crocker. It was about a man named Alan Zweibel (Jackson Evans) who is starting a job as a writer on Saturday Night Live and he meets Gilda Radner (Dana Tretta), who is also new to SNL. They are both kind of terrified so they hide behind a potted tree and they start talking and become lifelong friends. They go through some really hard times, and the relationship changes a lot, but they remain friends and partners in life until the end. It is about fame, complicated relationships, and fulfillment. I think this is a really bittersweet story that was wonderfully acted. Gilda had a song called "Let's Talk Dirty to the Animals," which was basically swearing at a bunch of animals. It was hilarious. It was an actual song that Gilda sang, and it was a spot-on impression from the performer. 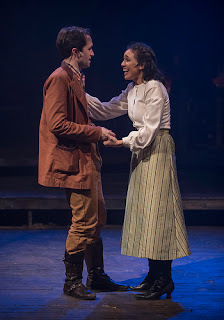 It is one of the times you get to see the contrast between what she is like as a performer and what she is like with someone she trusts, like Zweibel. You see that she seems more confident than she actually feels. I think people assume that if someone is funny, they must be confident, but a lot of times people use humor to cover up their insecurities. This play shows her strengths and her insecurities and doesn't just portray her as an amazing hilarious person, even though that is what she is. But she is more that just that; she a real person with real problems and feelings. You get to see her right before she goes on stage a few times, and that is interesting because you see how much of a switch there is. She could be dreading and terrified to go on stage, but when she gets out there, she just lights up. There is a scene where Gilda and Zweibel go to a basketball game together and he goes to get popcorn and when he come back, she has gone to sit on the bench with the players. These were some of Zweibel's idols, that he could have gotten to meet, but because Gilda didn't consult him about going down to the bench, he didn't get to meet them. She could have been more considerate, but it was also unfair to ask her to give up an opportunity. There is another scene where Zweibel goes to one of Gilda's fancy famous people parties, and the bouncer (Jason Grimm, who plays Everyone Else) stops him and says that he is not on the list. He had to pretend to be Hervé Villechaize, which is kind of ridiculous because Zweibel was very tall. Gilda has all of these famous people there and you can see that Zweibel feels out of place. Even though Zweibel the writer of play, doesn't portray Gilda negatively, you can see he still seems to resent a little the way he thought she was neglecting him for her fame. 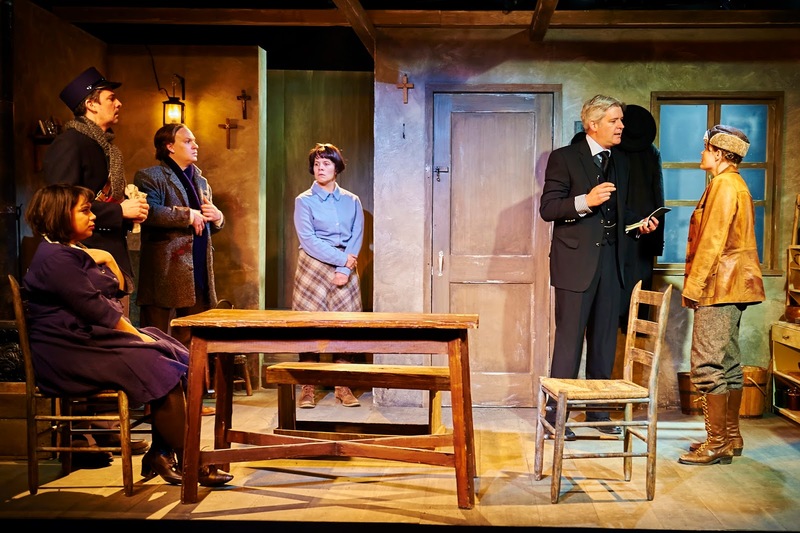 This play showcases a relationship that at one point was a romantic relationship that turns into a friendship and stays like that for the better. Near the end of the play they are talking about why they didn't get married and they said that they "just forgot." That is a really cute and bittersweet line, but I think there are a lot of real reasons. They have very different ways of living their lives. What Gilda really wants is the love of the public and Zweibel wants the love of one particular person. And it is hard to share the person you love with the rest of the world, and he shows in the basketball and party scenes that he wouldn't be very good at that. He calls Gilda "Gilbert" because she doesn't want him to call her what everyone else calls her. She wants to be different and special to him, because the general public knows her as Gilda and doesn't really treat her like a person. She wants to be treated like a person by the people she trusts and loves. I think that it is good that even after they aren't in a romantic relationship anymore he continues to call her Gilbert because he still is a very important part of her life. That is one of the most beautiful things about their relationship: how they continue to be vital parts of each others lives. This entire story is like a reverse romantic comedy. Instead of finding out that the person you should have been with was right there all along, they find out that the person they start out with, they were meant to be just friends with all along. They both find "Mr. and Ms. 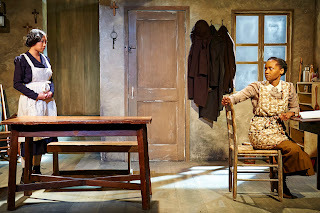 Right" while still having an important relationship with each other, which is what makes this play so beautiful to me. People who would like this show are people who like reverse romantic comedies, fancy famous people parties, and swearing at animals. I think that people should go see this show. It is a heartwarming and heartbreaking story, and I think it is acted very well. Once upon a time I went to a show and it was called You Got Older. It was by Clare Barron and it was directed by Jonathan Berry. 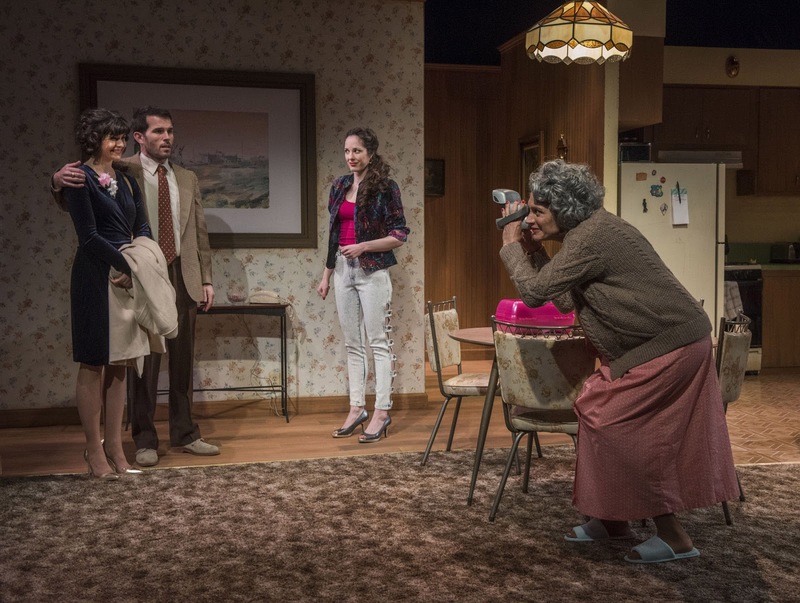 It was about a woman named Mae (Caroline Neff) who had moved back home with her Dad (Francis Guinan), who has cancer, after she lost her job and broke up with her boyfriend. It is about family, attempts at human connection, and happiness through hurt. I thought that this was really moving, truthfully awkward, and strangely hilarious. I think that is a perfect combination for a show. One of my favorite scenes was at the hospital with the family. Everyone is at the hospital and they are waiting for their dad to wake up. Each sibling plays a very specific role in the family. Hannah (Audrey Francis) is pretty put-together and is trying to take care of everyone there. Jenny (Emjoy Gavino) is very positive. She is trying to make the best out of everything and offering little ways to cope with their fear of losing their dad. Matthew (David Lind) seems uncomfortable but he uses comedy that makes everyone else uncomfortable to make them feel better. The family is all very open with each other--even when they are talking about inappropriate or kind of gross things. It's not like they are trying to not be themselves when they are together. They are so open with each other to the point that it is hilarious. They talked about this curse that when you knit a sweater for someone you haven't been with very long, something terrible will happen. Then Hannah started talking about her ex-boyfriend and how he evidently had died, but Hannah didn't tell anyone about it. It was funny in a dark and weird way that you feel bad about laughing. They are also merciless about making fun of each other. Like Hannah brings avocados to the hospital and no one hesitates to call her out on how ridiculous that is. It is not mean or cruel, they are all just laughing together. It seems like a family you would want to be a part of, even though they don't have everything figured out. Mae has two "love interests." One of them is a Cowboy (Gabriel Ruiz). He is not real; he is her sexual fantasy of the most exciting guy she could be with. And there is Mac (Glenn Davis) who lives in her hometown and knew her sister from when they were little. He is the more realistic version of what she wants in a man: he is sweet and kind and they share this strangeness. They don't get uncomfortable when they are talking about the unusual things they find attractive and like to do. Mac cares about people but sometimes makes mistakes; he is just human. The cowboy doesn't have any emotion, but sometimes that is what she seems to want: someone who doesn't have any baggage and is just there to be her fantasy. Her real life interrupts her fantasies (with Mac and the Cowboy) and she has to snap back into the real world. I think Mac actually exists, but he is trying to become her fantasy by sneaking into her room, like she told him she used to fantasize about. But it doesn't work out the way he had planned or she imagined because he is an actual person. There is a huge difference between real people and fantasies because real people have feelings and baggage and they want stuff too. One of the things you notice about the characters is that they are trying to be happy through a lot of pain. They each of them have moments of happiness but you can see how much they are actually hurt. There is a scene where Mae was sitting down at the table with her father. They are talking and getting ready to leave for his treatment. And he plays her a song that he thinks represents his experience with having cancer, and seems proud that he has found this song. They are just listening together and they seem to be happy but you can see how much Mae is hurting. Even though the song is more upbeat and saying everything could be okay, you can see how Mae is thinking how everything might not be okay. And her dad sees how Mae is feeling, but Mae is oblivious that he understand her at all. It is so sad that near the end of his life is the time she actually realizes that somebody actually understands her. People who would like this show are people who like moving father-daughter relationships, fantasy cowboys, and killer sweaters. I think people should definitely definitely go see this show. It is such an important story that needs to be told about a woman's desires, family, and the awkwardness of being a person. It has beautiful performances and heartbreaking and hilarious dialogue. I loved it. Once upon a time I went to a show and it was called Moon, Prism, Power! A Sailor Moon Musical. It was adapted and directed by Tiffany Keane Schaefer and the music was by Whirlwynd. It was a parody of the tv show Sailor Moon, which is about a high schooler named Serena, who is pretty clumsy and boy-obsessed, who one day meets a cat, Luna (Carrie Campana), who reveals to her that she has superpowers that turn her into Sailor Moon (Dani Mohrbach). And she has to fight evil from the Negaverse so they don't take energy from everyone. To defeat the Negaverse and its ruler, Queen Beryl (Grace DeSant), Sailor Moon has to find all the other Sailor Scouts: Sailor Venus (Mary-Kate Arnold), Sailor Mars (Cecily Campbell), Sailor Mercury (Katy Jenkins), and Sailor Jupiter (Magdalen Kay). She goes on a mission with her cat to find them. 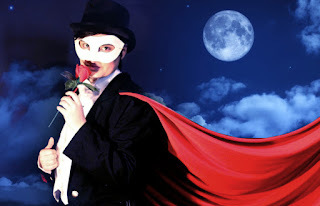 She meets a handsome stranger, Tuxedo Mask (Gaby Fernandez), who adopts many disguises. This show is for a very specific type of person: a person who could watch hours and hours of Sailor Moon and be content to see a live action version of the story-arc episodes of the show with some songs and jokes added. I think Tuxedo Mask is absolutely hilarious. He throws roses at people and knocks them out. He does this thing in disguise as Darien where whenever he walks into the room he takes off his sunglasses and they play this screaming rock star sound effect. Everyone in the audience was cracking up because Darien is practically winking at them and saying "I'm Tuxedo Mask," but no one on stage sees it even though it is obvious. There is a love triangle where Darien and Sailor Mars bond over how they make fun of Sailor Moon, but Darien is actually Tuxedo Mask who is in love with Sailor Moon. It is kind of a weird way to show the bond between Sailor Moon and Sailor Mars by having them have the same boyfriend just in different disguises. One of them has to give him up eventually, which shows us that even though they seem like sworn enemies, they actually do care about each other. I feel like the villains--Queen Beryl, Zoicite (Arnold), Kunzite (Jacob Bates), and Nephrite (James Martineau)--in this show are the most interesting characters because they have the most interesting backstories and motivations for everything. The actors did a good job showing that the character was serious about what they were saying even if the actor might be making fun of what the character is doing. 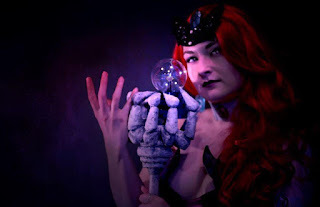 Queen Beryl was the most badass character, even though she mostly just sends people out to do her dirty work, because she has a motivation: to collect all the energy from everyone. And also when she doesn't like what someone does, she will kill them. She is pretty over the top, but she knows what she wants and is going to get it. Sailor Moon frequently complains about how hard it is being a Sailor Scout and how she doesn't want to do it anymore, and then Luna will tell her she has to do it. But with Queen Beryl, she wants that energy; she is her own self-motivator. I think it is more fun to watch because it is someone taking control. There is also a villainous couple, Zoicite and Kunzite, who are very over exaggerated from the original show but in a hilarious way that draws attention to every little hint they drop in the tv show about their relationship. And they make each hint very blatant, and there are innuendos galore. Every time both of them walk into a room together, they are very supportive in a strange and sexual way that is very hilarious. I did have some problems with this show. I feel like since this was a parody, it didn't have to be three hours long. I think everyone who would be interested in coming to see this show already knows basically what is going to happen. So you don't have to explain every episode where a Sailor Scout is introduced. You could condense that so that each character didn't have a dedicated episode, and things could get started more quickly. Of course in the tv show they didn't condense these episodes, but they didn't expect you to be watching it all in one sitting. In the tv show, all the Sailor Scouts say "Whatever Celestial Object They Are, Power!" and transform. But of course they can't just twirl around and magically have a different outfit on onstage. So what they do instead is they go backstage and change while music is playing. That takes a little while, so sometimes you felt like you were looking at a blank stage for a really long time. I feel like if they had found a way to wear the sailor costume under another costume that was easy to slip off while onstage, it would have seemed more like a transformation. If they had to change offstage, it would have been cool if they had projected a shadow of the spinning Scout on the curtain so it seemed like they were doing the amazing transformation that they do in the tv show. I think shows can be very long but still enjoyable. But when it comes to something that has a pretty limited plot and a lot of repetition, getting it more fast-paced is vital. People who would like this show are people who like taking energy for the Negaverse, sailor love triangles, and surprisingly painful roses. This show had a very short run, so you'll have to catch a remount if you want to see it. I think this show has some funny moments and performances and seems like a lot of fun for very dedicated Sailor Moon fans. Once upon a time I went to a show and it was called The Antelope Party. It was by Eric John Meyer and it was directed by Jeremy Wechsler. It was about a group of friends who were all big fans of My Little Pony and would make up stories and role play and cosplay as their favorite characters. There is a neighborhood watch who are trying to "clean up" the town and make it more "normal," so that basically only people in the Antelope party are safe. When the Bronies dress up, if they go outside, what they are doing is seen as criminal by the neighborhood watch, even though they aren't doing anything wrong. It is about being who you are no matter what other people say you should be, using a false front, and the dangers of the patriarchy. I thought this show was intriguing, kind of terrifying, and I had never seen anything like it before. 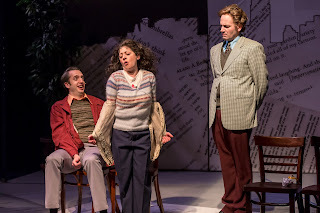 The show starts out with a bunch of friends, Shawn (Will Allan), Ben (Edward Mawere), and Rachel (Annie Munch), doing what they love with basically no problems. They are talking about their feelings and why they are happy to be together. They are admiring each other's cosplays (costumes by Karen Krolak). Shawn is Pinkie Pie, with terrifying anime eyeglasses. Ben is Fluttershy and has rainbow suspenders with wings and is altogether absolutely adorable. Rachel is Twilight Sparkle who had a unicorn horn and sparkly leggings. All they want to do is get on with the game, when Doug (Evan Linder) shows up in his Rainbow Dash sweatshirt and says Maggie (Anu Bhatt) has been kidnapped by the watch. This haven for all of them has been disrupted by this watch, which wants to control their behavior even though it isn't hurting anyone. They have a visitor named Jean (Mary Winn Heider) who thinks the Brony group is a front for a 9/11 conspiracy theorist group. But when she gets there, it is not. But the group is so excited to welcome a new Pegasister that they kind of forget to ask why she's there. Even though it seems like the groups are like the opposite of each other, they actually have lot more in common than you may think. They both make up scenarios and they both are hated by the Antelope party because they are not sticking with what the Antelope party thinks the truth is. Bronies are basically saying everyone should be friends and if everyone is nice, things will be fine. The 9/11 conspiracy theorists are saying, if we find out the truth, everything will be fine. But the Antelope party says if you follow us, everything will be fine. But their attraction is based on people's fear and love of power, whereas the Bronies are trying to be there for one another because basically their motto is "Friendship is Magic," which is the name of the tv show. When Maggie comes back to the group, she talks about the Antelope party and how she found out that her dad is a leader. She tells Shawn what really happened in the van, and he becomes her confidante and they get together. Maggie and Shawn have a toxic relationship because she is responsible for getting him to join the Antelope party. But it ends up being that he gets more into it (and out of it). Because the group is sexist he starts treating Maggie even worse and he gets all this credit for things that Maggie should be getting credit for. At the beginning it seems like Maggie is manipulating him, but he ends up manipulating her. I think it is really interesting to watch the person who was victimized become the victimizer. 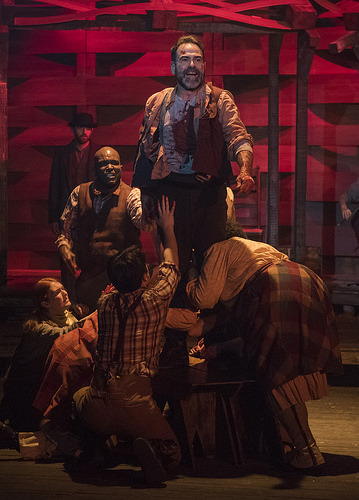 The Antelope party changes over the course of the play. When the young people join it, everything becomes heightened. It was never a good idea, but it became like this organization to take over the world with white supremacy and sexism. The same situation happens with Shawn as with the Antelope party. He is telling all these stories about how he is the victim and he is doing the right thing, but he is actually the powerful predator instead of the meek prey. Something that I was confused by but have a theory about is why they used Bronies as a vehicle to tell this story. This is a play that is not just about Bronies; it is about white male supremacy and fascism. At first, I was confused as to why they used Bronies as the oppressed group instead of a minority who is famously and more severely oppressed. 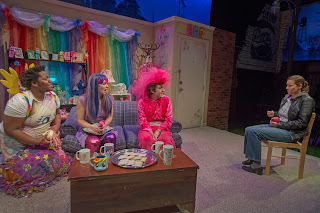 I have never seen a play about Bronies, though I have seen a lot of episodes of the My Little Pony tv show in my youth, and I think it is interesting to use Bronies because they are not a minority you think of immediately. There is no reason to oppress anyone, but people still do it, even though people know it is terrible. And using Bronies in this play as the minority heightens the craziness of the fascism that Antelope party is trying to implement. How can you hate My Little Pony or people who just want to watch and talk about it? They aren't doing anything wrong. It is not weird or sexual or creepy. They just want to be enthusiastic about a tv show. And it reminds you that there is never any reason for anyone to be oppressed. People who would like this show are people who like not-always-magical friendships, plays about fascist Antelopes, and terrifying anime sunglasses. I think that everypony should go see this show. It is such an absorbing story. 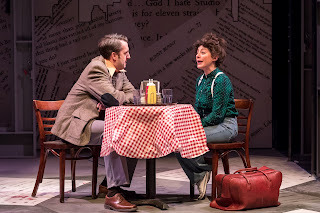 Everything--from the fabulous acting, to the set packed full of paraphernalia and references (by Joe Schermoly), to the sparkly costumes, to the strange sense of menace that you feel throughout the play--draws you in. I loved it. Once upon a time I went to a show and it was called A Midsummer Night's Dream. It was by William Shakespeare and it was adapted and directed by Jess McLeod. 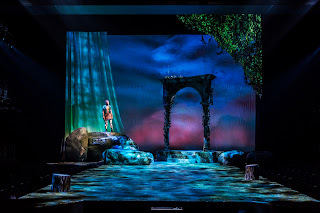 It is about Hermia (Faith Servant) and Lysander (Christoper Sheard) who are forbidden from being together because Hermia is engaged by her father Egeus (Jarrett King) to Demetrius (Andrew L. Saenz). And Helena (Ally Carey), who has been friends with Hermia since they were very young, is in love with Demetrius, but Demetrius wants to be with Hermia. 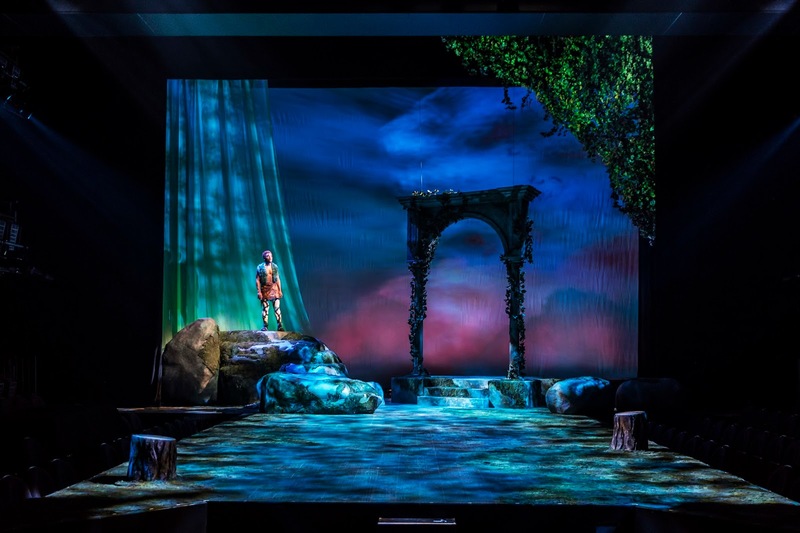 The four lovers go off into the woods where they encounter some mischievous fairies, Puck (Travis Turner) and Oberon (Sean Fortunato), who are trying to get a changeling boy from Titania (Christiana Clark), who is Oberon's queen. 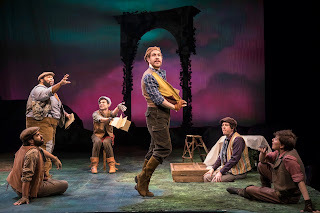 Also in the woods, the Mechanicals--Peter Quince (King), Bottom (Adam Wesley Brown), Snout (Richard Costes), Snug (Hannah Starr), Starveling (Drew Shirley), and Flute (Lane Anthony Flores)--are rehearsing to put on a play for Theseus (Fortunato) and Hippolyta (Clark) on their wedding day. This is a play about love, magic, and worlds coexisting and occasionally coming together. I think that this is a really good introduction to Shakespeare for kids and everyone in the audience seemed to be really into it. I think the set (by Lauren Nigri) was really beautiful. It looked like a Romantic period painting. It had this colorful background and there were ruins and big rocks. The lover's costumes (by Izumi Inaba) looked like something out of a Jane Austen novel. I think they set it in the Romantic period because they were trying to showcase, especially with the fairies being trees, the artificial naturalistic beauty of the Romantic view. The fairies are not really trees, they are pretending to be. They are tricking everyone around them into thinking something is nature that is not. Like someone building an arch and then ruining it so that it looks like nature has taken over even though it hasn't. The lovers are Romantic romantics because they are all obsessed with love and matching up but also with finding beauty in the hardest situations. Like when Lysander and Hermia have to sleep on a bank and they are so enthusiastic about everything that is happening, even though they have to sleep on the "dank and dirty ground." The scenes with the Mechanicals weren't as wacky in this production as they usually are. Usually they take themselves so seriously, especially Bottom, which is where a lot the humor comes from. But this version of Bottom didn't seem super stoked for the show and he seemed sort of confused about Titania, which I think is a interesting approach to the character. It is more realistic for him not to just go along with a random woman seducing him in the woods and be totally fine with it. But when you make Bottom less ridiculous it means those scenes are a lot less crazy. In "The Most Lamentable Comedy and Most Cruel Death of Pyramus and Thisbe," two of the performers broke out of their shell or hit their stride during the performance. I though that was interesting because you got these characters not just as vessels for comedy. The Lion, played by Snug, started out very mousy and scared but then everyone was encouraging her and Snug got back up on stage and roared her little heart out. It was so adorable and she was just so motivated and transformed. A similar thing happened to Thisbe, played by Flute. 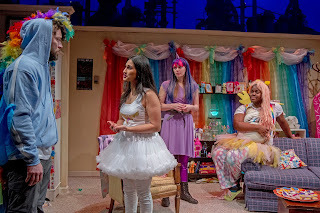 Thisbe starts out ridiculous with a very monotone and high-pitched voice but, then Flute turns the scene where Thisbe discovers the dead Pyramus into a moving scene and actually starts acting and doing well with it. Everyone in the theater started applauding like crazy. Even though there were these moments of Snug and Flute discovering their talents and actually showcasing them, that doesn't mean there wasn't any comedy in Pyramus and Thisbe. If there wasn't, it wouldn't have felt right. Snout, who played the Wall, just seemed really excited. It was hilarious how excited he was to play the Wall. Then once he got to the show, he took it so seriously, and was making sure everyone understood he was the Wall, and he was so proud of it. It was adorable and hilarious. The moon, played by Starveling, was also hilarious. He started getting very angry when people would talk over him. And he ripped the dog out of the thorn bush and started speeding through his lines because he was so angry that people were talking over his moment. There was a choice they made near the end of the play, when the lovers finally get together: that Helena and Demetrius share a moment together alone on stage. I've never seen that happen. 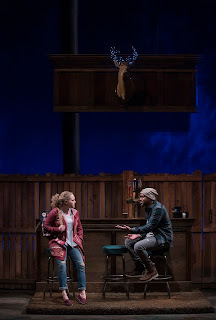 I thought it was really nice because this is the relationship that has changed the most, and it shows the difference between real human connection and the purposeful artificialness of some of the rest of the play. They kiss and then they talk about how they are going to talk about their "dream." That line is usually said to the group, but giving it to a scene between just Helena and Demetrius is sweet and effective. Puck has changed the way Demetrius feels about Helena by using a magical natural object (a flower) to unnaturally affect his feelings. It usually doesn't work out well to force someone into a relationship. But I had some hope for this relationship because they show you this moment of actual connection with just one line that shows you that they are actually going to talk to each other. Maybe they aren't just together because a random fairy told them to be. People who would like this show are people who like Romantic sets, enthusiastic walls, and random fairies hooking you up. I think that people should go see this show. It is a great way for kids to learn about Shakespeare's plays, and it has some great performances in a beautiful space. I liked it. Once upon a time I went to a show and it was called Merrily We Roll Along. The book and music were by Stephen Sondheim and the book was by George Furth, based on the original play by George S. Kaufman and Moss Hart. It was directed by Michael Weber. Music direction was by Aaron Benham and the musical staging was by Christopher Pazdernik. It is about three old friends Frank (Jim DeSelm), Mary (Neala Barron), and Charley (Matt Crowle), who were all writers who met each other in the '50s. It is about their friendship and how they grow apart (or in this case grow together because the story is told backwards). It is about Frank looking back on his life and realizing all the mistakes that he's made. It is about remorse, unrequited love, and making it in the artistic world. I thought this was a really fun show about not-so-fun topics. I loved the score, and the performances were great. My favorite song in this show is "Opening Doors." It is basically about all the ups and downs of an artist's life: getting jobs, losing jobs, auditioning, disappointment, and excitement. This is a thing about the artist's life that doesn't get written about a lot in musicals--the experience of the people writing the musicals. You can be passionate about it and still be annoyed with it a lot of the time. I liked how they used typewriters and other unconventional objects, like pencils, as musical instruments. It is also showing how art is work and they are turning this object that is thought of as being used for work into something to make art. Inside this song there is another song called "Who Wants to Live in New York," which Charley and Frank take to a producer, Joe (David Fiorello). He says that it is not catchy enough. It makes you wonder how Sondheim ever got produced, since I think it might be one of his catchiest songs! That is not to say I don't love Sondheim. He is my favorite musical writer, but you can't always tap your feet to the beat. Earlier in the show, but later in their lives, the friends--along with Joe and Beth (Aja Wiltshire), Frank's wife--sing a song called "It's a Hit" after Charley and Frank have just opened their musical, which is the backwards payoff of opening doors. It is basically talking about all the people they had proved wrong. 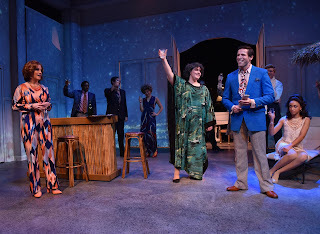 For some reason, in this play, even though you know everything is going to be terrible soon for almost everyone, you still feel happy for everyone when something good happens to them. I think there is a very cool contrast between the songs, but they both make you happy. Even in "Opening Doors" there is a sense of happiness with what they are doing, even if they aren't yet as successful as they want to be. Mary and Charley sort of get left in the dust once Frank has a hit. Mary has been in love with Frank for a really long time, but has always hid her feelings. In the first scene of the play, everyone sings a song called "That Frank," at a party which is after his movie premiere. You get to see how she feels from the beginning of the show; she loves him but she feels like he is being a jerk all the time. She is so mad at him at the party, and she misses the old Frank. That sets us up to pay attention to how she looks at him or says different little lines in the scenes later on in play. You want to know where who Frank is today came from. And you get to know that because of how Mary keeps singing and talking about how things used to be. I wish the writers had given her a bigger part other than just being in love with Frank. But I think she actually rocks the reprise of "Not a Day Goes By," which she sings during Frank and Beth's vows. It is so heartbreaking and she sings it beautifully. It is not like I think the unrequited love part was unimportant of not effective, or didn't add to the story. I just think they should have given Mary more to do than just be in love with someone. I wanted to know about her backstory and her career. Charley sings a song called "Franklin Shepard, Inc." that is basically Charley's side of the story, talking about how Frank is just a corporation instead of being an actual person who writes music with him. The song is super fast and there are a lot of sounds mixed in with the talking. And everything is so rapid fire that your brain doesn't fully hear that somebody went "brringgg" instead of saying an actual word. I think Crowle did a great job with this with making the repetition in this song still interesting and funny each time. Both of Frank's wives, Gussie (Keely Vasquez) and Beth, had their hearts broken by him. Something that I liked about that is that they didn't just go off crying. They actually had complex feelings about it. Beth sings a song, the first "Not a Day Goes By," which is the second chronologically, where they are in divorce court and Frank asks if she still loves him. And she says, "Of course I do. There is not a single day that I don't love you, but you have hurt me so many times that this is not going to work out." She seems to be singing it angrily and fiercely, which is a great contrast to the reprise, where she is saying her vows to Frank. It shows you love is hard and complicated. You continue to love the person you love even though it is not the healthy option. And Beth eventually realizes that even though she loves Frank, she shouldn't be with him if it isn't good for them anymore. The contrast between the songs shows you that love can be very scary but it can also be beautiful. And then there is Gussie. She is not sad and confused. She was very direct and asked Frank "Are you in love with this person?" And he said yes, and she was like, "Ok. Goodbye. You're a jerk." It might just be because she has been through so many divorces before and she is used to the feeling of it. This is her most sympathetic moment because at that point you don't know that she was the other woman in Beth's case. I think it is interesting how the sympathy you have have for Gussie decreases as the play goes on. Your sympathy for a lot of the other characters either stays the same or increases. Except for Frank who wobbles around. He could seem like a good person in one scene and in the next scene he could be acting insanely selfishly. Frank is a kind of an anti-hero. He has so many flaws, but you still want the best for him because that will be the best outcome for the people around him who you think are better people. People who would like this show are people who like heartbreaking unrequited love ballads, corporation people, and typewriter songs. I think people will have a lot of fun at this show. I enjoyed the great performances and the amazing score. I liked it. Once upon a time I went to a show and it was called Nice Girl. It was by Melissa Ross and it was directed by Lauren Shouse. It was about a woman named Josephine (Lucy Carapetyan) who was in her late thirties living with her mom, Francine (Lynne Baker), in a suburb of Boston in the 80s. And she was feeling pretty crappy about her life because she felt like she had wasted it. She feels like she needs to find someone to be with and find some friends. She becomes friends with a girl from work named Sherry (Stella Martin) who is a lot more free spirited and takes on Josephine as a project to teach her how to have more fun and attract men. 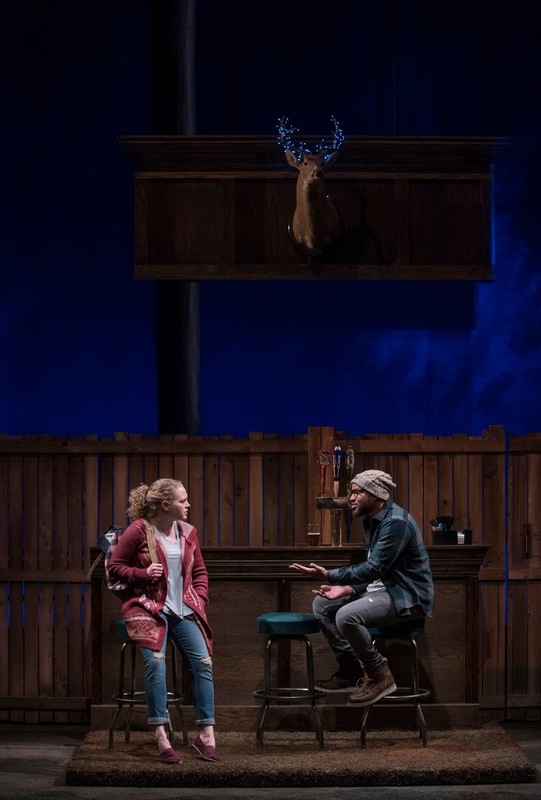 Josephine reunites with a friend from high school, Donny (Benjamin Sprunger), who is going through a separation with his wife and works at the butcher shop. But her mom isn't too happy about it and is still treating her like a teenager. It's about getting older, mother-daughter relationships, and self image. I was really pulled into the story and it had talented actors. I really liked it. I think the friendship between Josephine and Sherry is very sweet because they both have something they can give each other. Josephine can give Sherry a listening ear, and Sherry can help Josephine on her quest to be a more exciting person. I really loved the scene where Sherry was helping Josephine get ready for her date. It was the first time Sherry met Francine, who was not very pleased to see her, especially in such a revealing top. Sherry was doing Josephine's hair, and she wins over Francine by talking about Frank Sinatra. I thought Sherry was a hilarious character; she had all these insane stories that she didn't seem to know were crazy. But she is also a really sad person. She's been betrayed so many times and she doesn't get to spend much time with her kid. She is disappointed in herself and she wants another chance with another guy, but it is very hard for her. I think she is a really interesting character who should have her own spinoff series. I don't think she is a bad influence. It is weird because she doesn't make a lot of smart decisions, but she knows how to have a good time and is learning to be confident in herself and Josephine really needs that. She is also a very caring person. She ends up being a really good friend who is willing to give up something she wants for her friend. Francine and Josephine had a very difficult relationship. Francine thought that Josephine was "the nice girl" and wanted to keep her that way. It is a very teenage drama about a 30 year old. That was a very new concept, and I really liked that. Francine doesn't want her daughter to have any fun or go out to any clubs even though she is a grownup. Francine is also claiming to be very sick, but her daughter doesn't believe her anymore. Josephine is still trying to help her, but her mom doesn't realize that this wasn't really Josephine's plan for her own life. The sad thing is that they seem to really love each other; they just have a difficult relationship because they aren't the same kind of person. Or at least Josephine doesn't want to be like her mother, even though she might kind of be like her. She's mad at her mom because she feels like her mom is taking advantage of her. Francine wishes that her daughter would spend more time with her and confide in her, but she doesn't know how to express that to her now. She keeps talking about ice cream, and that's not something that appeals to Josephine every night now because she is a grownup. So Francine ends up nagging her almost, and then Josephine ends up resenting her. And when Sherry has a problem, Francine is able to do for her what she should be doing for Josephine, which is comforting her and helping her when she needs it. Francine can be the mom Josephine wants her to be, but just not for Josephine because their relationship is too damaged. Donny and Josephine have this really adorably awkward relationship. They both bond over feeling like failures, which might not be the best premise for a relationship. They are both pretty desperate for attention and for love. He starts to win you over when he talks about making dinner for her sometime. But he has a lot of secrets. He also seems scared to be alone because he was married for a really long time. And now that he is dating again, he is kind of terrified to make anything official in case his wife wants to get back together, which is really sad. But he keeps leading Josephine on and telling her things that mean a lot to her, but don't mean the same thing to him. I think he is a really complicated and strange character. You don't get to know a lot about him until near the end of the play. He is an interesting character because at first he just seems like the "prize" the lead character is going to get, and in a lot of movies and plays that role is a woman. The trope is usually somebody seeing the "prize" and being like, "I'll never be able to be with them" but then at the end they get together and you usually don't learn anything about the "prize." In this play, you actually get to learn the dark things about the "prize," and not just view this person as an object. People who would like this show are people who like complicated "prizes," obliviously insane stories, and ice cream with your mom. I think people should go see this show. I liked how it played with the high school drama idea and turned it into something new. I really liked it. Once upon a time I went to a show and it was called Hinter. It was by Calamity West and it was directed by Brad DeFabo Akin. It was about the Gruber family--Andres (Jim Poole), Cazillia (Melissa Riemer), and their daughter Viktoria Gabriel (Eunice Woods) and granddaughter Elsa--who lived on a farm in Bavaria. They were murdered one night and their neighbors Frieda (Lauren Sivak) and Klara (Sigrid Sutter) came over to see what had happened to them and discovered them. They call in Inspector Herzog (Peter Moore) from Berlin and people start to seem more suspicious and the audience discovers secrets about the family and their relationships with each other and their neighbors. I thought this play was absolutely fascinating. 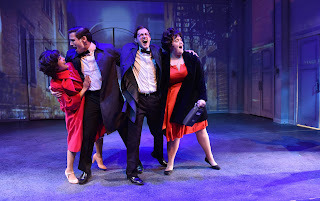 I love murder mysteries, and I loved watching this one unfold on stage. It was suspenseful, eerie, and occasionally humorous. I think it is interesting how this show works backwards. You see everyone finding the bodies first before looking at the actuality of the time leading up to their deaths. I think that is really cool because it lets you theorize before you get more information. I also really liked how you get to see all of these meaningful relationships between women: some are friendships, some are romantic, and some are parent-child. But you really got to see into each one. They all had meaning to them, and they all had a backstory with each other. This play is focused on the female relationships. The relationship between Elizabeth (Sasha Smith) and Klara is very complicated. There isn't a single word to describe it. They are romantic with each other and they want to protect each other, but Elizabeth did something that really hurt Klara which they don't talk about for a long time, which exposes the flaw in their relationship. Viktoria's relationship with her mother is also very complicated because she loves her mother, but her mother has stood by her father's side even when she found out about the terrible ways he has behaved. Maria (Aurora Adachi-Winter) and Frieda are the beacons of light for Viktoria because they are offering her a way out. But there is an itching suspicion that I have that they might have ulterior motives. 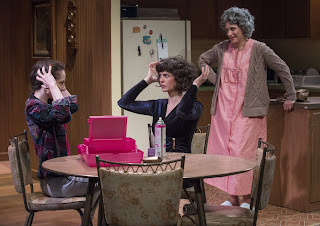 Just because this play talks a lot about female relationships, that doesn't mean they idealize them. I think it is really awesome how many layers they showed in each of these relationships, even though this play isn't super long. The writer and director don't cram the play with facts and action, they find a way to make everything make sense but also keep a bit of the mystery in the relationships. They don't tell you everything, but you have enough to understand the characters. 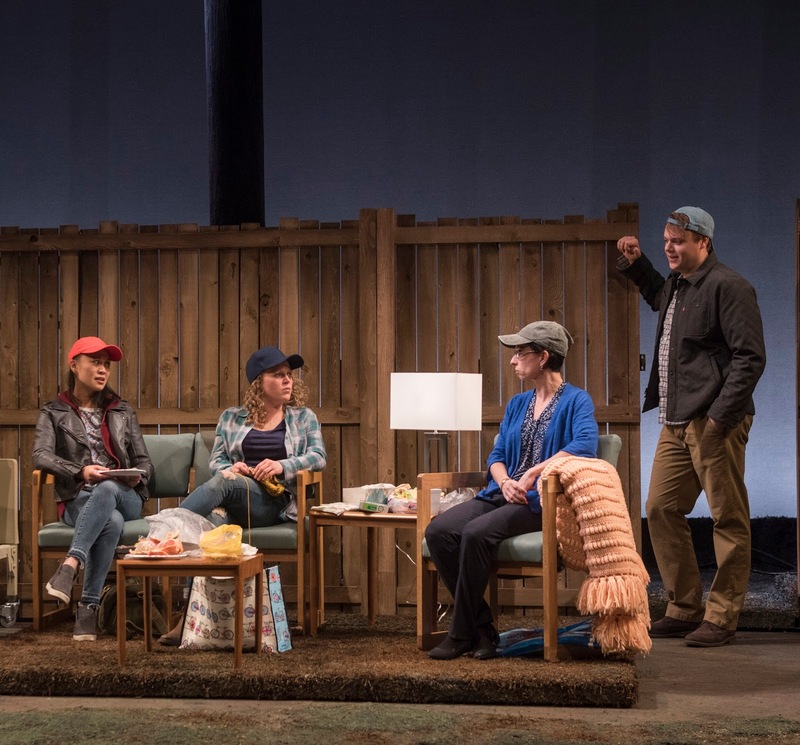 It is not that the men don't have significant parts, it is just that the play is more focused on the women's relationships and builds them up to something instead of them just being there, like happens in some plays. The men all seem like outsiders, even though some of them live in the area. The inspector, however, is a complete outsider. He is from Berlin, doesn't know anyone, didn't know any of the people who died, and is therefore not very respectful of the bodies. The postman, George Siegl, (Alex Gillmor) just sees them a few days a week. Lorenz (Nate Whelden), Viktoria's admirer, didn't use to be an outsider, but he has come back from the war a changed man, and not in the healthiest way. Andres lives in the house with the family, but he is sort of an outsider because he has done terrible things. He is blatantly disobeying the rules of how a family should behave toward each other. 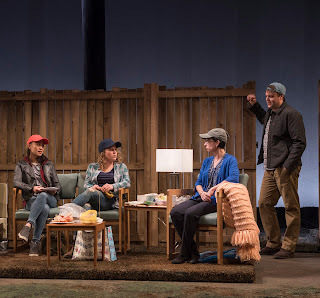 In this play, men are the outsiders, and women have this ring of connections. I like how this play takes normal everyday occurrences and puts more meaning to them. 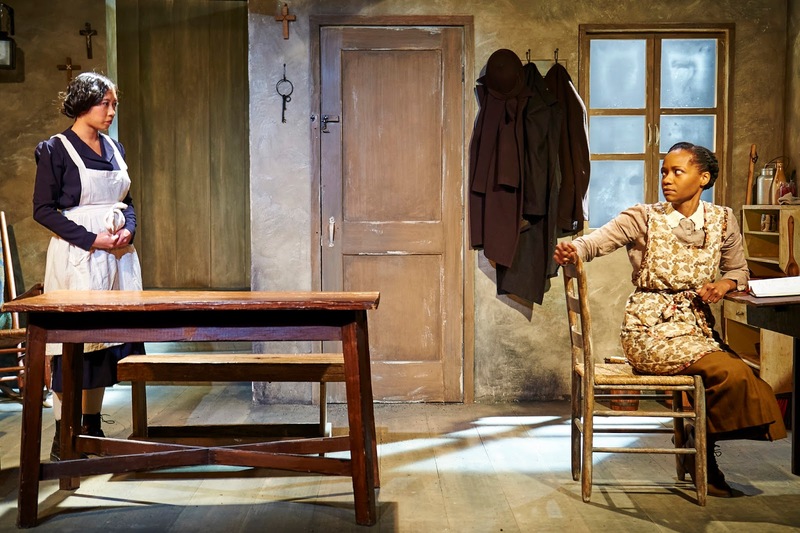 In both acts of this play, people eat Viktoria's bread. In the first act, Frieda, Elizabeth, and Klara are hungry so they decide to eat some of it. And they start talking about how terrible the bread always was. In the second act, which happens earlier in time, Klara eats the bread and acts like it is good. She covers up her true feelings about it. Viktoria seems to be challenging everyone who eats her bread to tell her it is terrible. I think that the bread that Viktoria makes seems like it could be a metaphor for secrecy then. All these women are trying pretend that nothing is the matter even though something definitely is. Even when someone is challenging them to tell the truth, it feels impossible to because they feel like not admitting that anything is wrong is probably what Viktoria wants. It is sad because she is not specifically asking for help, but she still wants it. There's a really great moment in the play where Frieda is talking to Maria about Viktoria's escape plan. And she says that you can't help people if they don't ask for it. And Maria says, "Yes you can. You absolutely can." I think that is a beautiful moment that shows how Viktoria might want to be helped and be able to be helped even though she feels like she can't ask for it. It is really sad that when she decides to pull the trigger on a big decision she doesn't get to make it. That's what makes this play so compelling and depressing is they way that you already know the ending of her story but you are still hoping that maybe something will work out. I have a lot of theories about who might have killed everyone, but I don't want to spoil anything. So you can click here if you want to see my theories. People who would like this show are people who like Bavarian murder mysteries, complex relationships among women, and secrecy bread. I think that people should definitely go see this show. It is a really great story with compelling characters. I'm still theorizing about this play and it was a lot of fun in a creepy way. I loved it. Once upon a time I went to a show and it was called Hatfield & McCoy. It was by Shawn Pfautsch; the original songs were by Pfautsch and Matt Kahler. It was directed by Matt Hawkins. It was about two families, the Hatfields and the McCoys, who were both from the South. They had had a feud ever since the Hatfields had killed Asa "Harmon" McCoy (Cody Proctor) because he was a Union soldier. When Rose Anna McCoy (Haley Bolithon) and Johnse Hatfield (Kyle Whalen) fall in love, their families become pitted against each other even more than before. It is about devotion to family, forbidden love, and violence. I think this is an absolutely fascinating and breathtaking show. I really liked it. This is a romanticized version of the relationship between Rose Anna and Johnse. The real version was they met, they liked each other, he impregnated her, abandoned her, and then married her cousin. But I like this version a lot better. It would have been cool if they'd kept the part where she rides a horse, while pregnant, in the dark mountains to warn him about a McCoy attack. (He STILL married the cousin.) Then they could have used the House Theatre's puppet skills! Rose Anna and Johnse seem to be dumb in love at the beginning but by the end you see all the ways they do connect and you start to think it is real love. This is a lot like Romeo and Juliet because they fall in love over dancing together. I think you actually get to see even more depth to Rose Anna and Johnse's relationship, because they don't spend so much time talking about how beautiful the other is. They seem to be actively trying to get everyone to get along, but Romeo and Juliet conceal their love instead of using it for good. Rose Anna and Johnse sang a song together that was a version of the morning lark/nightingale debate that Romeo and Juliet have. I thought it was a really sweet rendition of it. They seemed to be singing it to each other, which I thought was very nice. It was just a genuine and adorable song. I also really like how they had Rose Anna sing Romeo's part of the balcony scene and how she was admiring him from afar instead of the other way around. I think the violence in this play was really effective. There were so many guns you couldn't keep track. It made this story not just a love story, but gave it some action. It wasn't just for the heck of it; it moved the story forward a lot of the time. It is definitely trying to say that violence is not the answer, but the choreography (by Hawkins) of the violence makes it really mesmerizing. The people who were using the most amount of violence were always in the wrong, and that was clear, but they were complicated characters, not just villains. I feel like Devil Anse Hatfield (Robert D. Hardaway) was a very violent but sympathetic character. You could see he loved his family, but he wouldn't put anything else above that. And he only seems to care about his own family, and will do what he has to do to keep them safe, and he's also paranoid about it. He's not selfish; he's clannish. He thinks that his family is most important, and even when he is faced with someone who thinks family should be first, like Sarah McCoy (Stacy Stoltz), he has sympathy with her but not enough to change his behavior and spare her family. The first time Devil Anse actually loses someone, he uses violence to mourn them. And that leads to more mourning and more violence. It is an endless cycle of violence and death and loss. Even though the families have a feud that has been going on for a really long time, they share a lot of the same interests. They both love folk music. They both think family comes first. They both believe in God, but they have slightly different ways of approaching religion. And neither family was good at managing their children or at family planning. The McCoy boys--Tolbert (Tommy Malouf), Pharmer (Royen Kent), and Bud (Ethan Peterson when I saw it)--and the Hatfield girls--Victory (Jenni M. Hadley), Ellie (Tia Pinson), and Grace (Ann Delaney)--are always running wild; they always seem to have a gun or a knife. They could have done a three brides for three brothers situation there, but the brides would have killed the brothers. 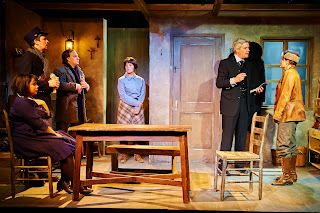 It was interesting that the McCoys seemed more refined in general with their plays and their no-nonsense father (Anish Jethmalani) and sweet mother, but they had the most unpredictable family member, "Squirrel Huntin" Sam McCoy (Bradley Grant Smith). Sam never stopped being drunk, but he seemed to also care about family, which was sad because he couldn't help them. And when he tried to help them it was drastic. Levicy Hatfield (Marika Mashburn) also seems to drink her problems away, but she never gets the opportunity to do anything as drastic as Sam did. People who would like this show are people who like forbidden love stories, drunk uncles, and loads of guns. I think this is an awesome show. It is a compelling, romantic, and complicated story. I really liked it.